Imagine you are anywhere but on stage, and you are unprepared. Somebody asks you to do a 'magic trick' (yeah, they know who you are!). You answer you would like to, but you have nothing with you, but a pen and a few business cards. You take out your business card holder or box, and you start amazing your audience. Now, imagine you would take a deck of cards. It would be all different … Nobody would believe you are unprepared! 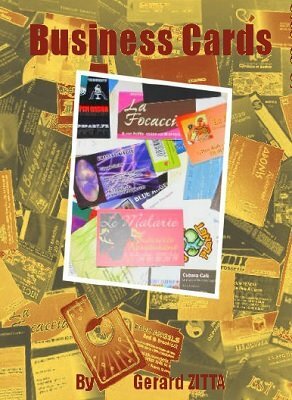 This ebook is a compendium of Gerard Zitta's effects, that can be done with business cards. They all 'look' impromptu, and most of them are indeed impromptu as long as you have your business cards or blank index cards. Effects that are completely impromptu. No preparation is required. In most cases, all you need is a pen and business cards, sometimes blank on both sides. Effects that require either some setup or an additional prop. The preparation is simple, and the prop easy to find. Finally, nothing is difficult in this ebook. Only one sleight will require a bit of practice but it can be replaced by a simpler one. Otherwise, most of the effects will be hands off, or just require common sleights such as double lifts or turnovers. There is no "billet work" involved. They are mainly mentalism effects. ADDITION V 2, and the new 'GZ control': This variation is perfect for mentalists and blank business cards. 99% impromptu: You need a little bit of preparation or an additional prop with you, but otherwise it will look impromptu to your audience. 1st edition 2013, 115 pages.